Fossils found by workers digging a tunnel for a new railway line in Los Angeles have been identified as the remains of a giant sloth and a bison. 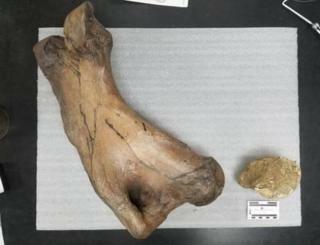 The "amazing discovery" of a sloth's hip bone and a fragment of a bison's radius bone was made about 16ft (5m) below ground in Park Mesa Heights. Scientists say the Harlan's Ground Sloth could have weighed 1,500lb (680kg), and been up to 10ft in length. The sloth and bison species have been extinct for at least 10,000 years. The discovery was made on 16 May and it took scientists at the La Brea Tar Pits and Museum about eight days to identify them. The bison and sloth probably lived about 11,000 to 40,000 years ago, in the late Pleistocene area, according to the Metro press release. Other ancient large mammals that became extinct around the same era - following the last ice age - include massive camels, mastodons and mammoths. The remains of an ancient camel and a mastodon or mammoth were discovered earlier this year during excavation beneath Wilshire Boulevard as the city expanded the Metro's Purple Line. The latest two fossils discovered are currently being held at the Paleo Solutions laboratory, and may later be transferred to the Natural History Museum of Los Angeles.